Reaching for the stars is not a far stretch for astronomy students and graduates involved in the latest Apache Point Observatory Galactic Evolution Experiment project. 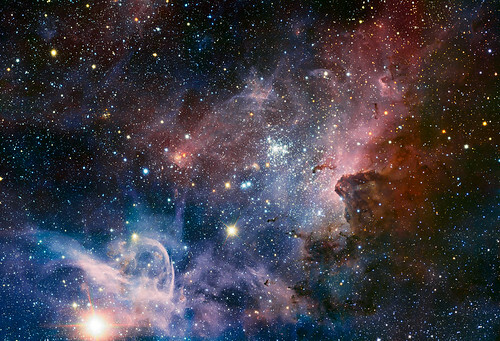 The project grants students access to as many as 300 star clusters at once that have never been visible in this capacity and clarity, assistant professor of physics and astronomy Peter Frinchaboy said. Frinchaboy said he worked for the past two-and-a-half years to get the university access to APOGEE, which is a part of the Sloan Digital Sky Survey III project. 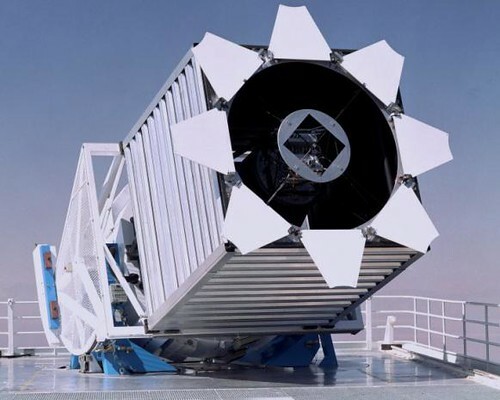 The total scope of the APOGEE project includes over 300 scientists from around the world and collaboration with other universities and research institutes, he said. The Sloan Digital Sky Survey is quite an effort — and the potential it holds for astronomers’ studies is astounding. 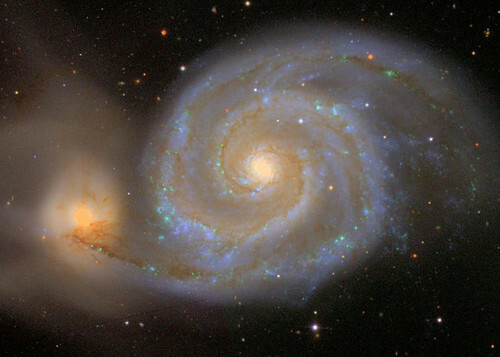 The SDSS telescope’s image viewing tool is pretty cool, too. World’s satellite sector, in unprecedented show of unity, presents letter signed by close to 100 satellite companies to chairman of UNIDROIT conference expressing opposition to Draft Space Assets Protocol, that threatens the stability of satellite financing. Director of Defense Intelligence Agency reveals that Beijing is developing missiles, electronic jammers, and lasers for use against satellites, under guise of supposedly non-military space program. ESA signs $1.8 billion deal with Thales Alenia for six next generation weather satellites, after acrimonious debate over decision not to award to Astrium of Germany. MEASAT has a partnership agreement with Belgium Satellite Services for satellite capacity on the soon-to-be launched AFRICASAT-1a for coverage in the Middle East, Africa, and Southern Europe. Satellite bandwidth demand keeps soaring despite budget cuts. United Launch Alliance Atlas V rocket, with 200th Centaur, successfully launches Mobile User Objective System-1 satellite. News that the son of Chinese premier Wen Jiabao has taken the helm of APT Satellite Holdings sends shares of the Hong Kong-traded stock up nearly 50%. Long March 3C launches fifth Compass-G satellite into orbit. U.S.A.F. and Lockheed Martin deliver the second Advanced Extremely High Frequency Flight communication satellite to Cape Canaveral. Intelsat gets subcontract to provide satellite connectivity for Iraqi Ministry of Defense network of 150 remote VSAT terminals. SES announces that Brazil’s Rede Novo Tempo de Comunicacao has renewed and expanded a long-term capacity agreement for the distribution of its video and radio channels throughout Latin America, the Caribbean, North America, and Western Europe. South African satellite systems company SunSpace says its Sumbandila satellite has paved way for South African satellite to be built over which the South African National Defence Force could have total control. Motorvision, Europe’s leading automotive-themed content provider, selects Asia Broadcast Satellite to distribute is content across the Asian continent. Death of American journalist Marie Colvin in Syria raises concern about the safety of using satellite phones in areas of conflict. GE Satcom is rebranded Signalhorn following its recent acquisition. C-Com and iSat partner on X-band enhancements for iNetVu terminal. Dish Chairman Charlie Ergen says Dish Network needs to package mobile wireless services with its video offering to remain competitive, explaining rationale for investing $4 billion in wireless spectrum since 2008. Army leaders outline plans to upgrade tactical communications network, pushing satellite communications down to the company level. U.S. Air Force and Lockheed Martin team deliver second Advanced Extremely High Frequency Flight communication satellite to Cape Canaveral. Google asks FCC to approve satellite antenna farm that would sit next to its existing data center in Council Bluffs, IA. Etilisat to quit Indian telecoms market on heels of recent Indian Supreme Court decision cancelling 122 mobile licenses. Entry of Eutelsat’s new ATLANTIC BIRD 7 satellite into MidEast market spurs growth of digital and HDTV channels across Middle East and North Africa. Comtech Telecommunications Corp is awarded $1.0 million contract for medium-power Tri-band amplifiers for a vehicle-mounted tactical satellite communications system. As LightSquared’s troubles continue, layoffs begin. Scandinavian satellite company Viasat Broadcasting extends its live broadcasting rights to the National Football League in Sweden, Norway, Denmark, and Finland until the end of the 2017 NFL season. LightSquared withholds $56.3 million payment to Inmarsat. Loral selects FMV for Thor 7 software contract. Gilat selected by JSC NURSAT to deploy broadband satellite communications solution in Kazakhstan. Newtec enters agreement with InSat to supply and install Sat3Play hub and terminal technology and deliver next generation Ka-ban d communications over Afghanistan. Boston City Council may pass resolution requiring satellite companies to install dishes in locations that don’t affect aesthetics of a neighborhood. Y1B satellite launch delayed till April. Scientists seek “celestrial broom” to clean up space mess jeopardizing low earth orbit satellites. Moscow blames radiation damage to an SRAM chip aboard the Phobos-Grunt probe for its failure, but skepticism meets the official conclusion. Pretty cool little project via MAKE Magazine (vol. 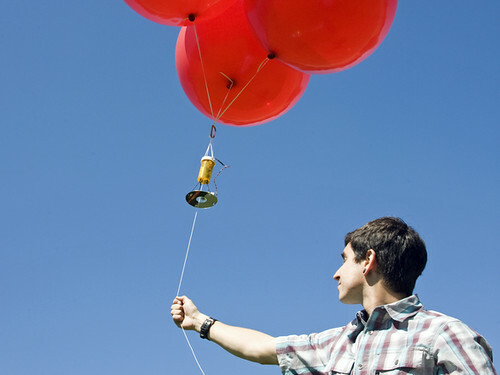 24, page 80): a helium balloon “satellite” camera platform. The first time I saw a satellite photo of my house on Google Earth, I expressed shock at the “Big Brother” implications of an all-seeing, commercial eye-in-the-sky. But meanwhile, I was also secretly disappointed with the picture quality and clarity because (Orwellian angst aside) I needed better overhead images for my own use — to help me lay out a new driveway and complete a birds-eye-view CAD drawing of our lot. So I decided to design and fabricate a simple helium balloon “satellite” camera platform, tethered to the ground for ease of control and retrieval, and dedicated to a single purpose: to capture aerial images of my house and surroundings. 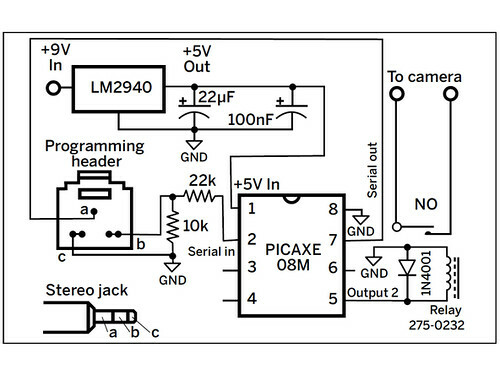 Here’s how I completed this project using inexpensive and readily available components — helium balloons on a nylon kite string, a drugstore camera perched on a platform made out of an old CD, and a PICAXE microcontroller housed in an empty pill bottle. Seems simple enough. Not as dramatic as the $150 MIT project that yielded near-space photos, but it’ll do. Governments have jammed satellite reception for years, most recently in Libya, Egypt, Bahrain, et. al. Broadcasters have been complaining for years, but now they’ve the got power of the ITU behind them. At the WRC-12, the ITU membership voted in favor of government to take “necessary actions” when satellite broadcasts are jammed. 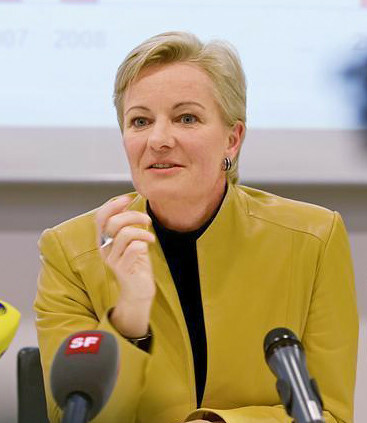 The European Broadcast Union, along with media freedom-fighters, human rights advocates and broadcasters such as the BBC, Deutsche Welle, Radio France Internationale, RFE/RL, Inc.’s Radio Farda. Radio Netherlands Worldwide (RNW), and Voice of America. What “necessary actions” might be remains to be seen. 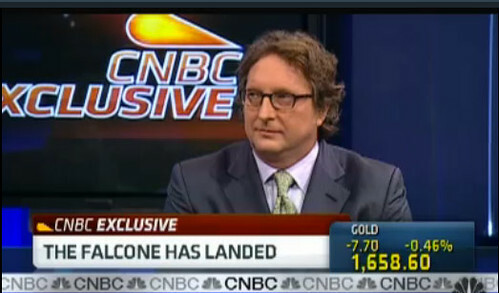 Falcone’s telecom troubles mount, as the Harbinger Fund investments in LightSquared jeopardize investors’ value and a group of investors sues in federal court. Latest Pentagon spending plans scale back push to use commercial satellites to supplement the military’s communication and space efforts. Second attempt to launch Atlas V rocket with first MUOS satellite is scrubbed due to weather conditions. U.S. bankruptcy court approves TerreStar reorganization plan; Dish Network prepared to close previously approved acquisitions of TerreStar and DBSD upon FCC approval of license transfers. Eutelsat and ViaSat receive Industry Innovators Awards from the Society of Satellite Professionals International for development and launch of their High Throughput broadband Satellites, KA-SAT and ViaSat-1. General Dynamics demonstrates first MUOS satellite-based communications on JTRS HMS Radio. NSR free webinar coming February 22 – Military budget cuts and troop drawdowns: What’s the impact on commercial satcoms? NASA selects 33 small “cubesat” satellites to fly as auxiliary payloads aboard rockets. Global Satellite USA launches Iridium Pilot, Iridium’s second-generation maritime broadband platform. Satlink expands the reach of God’s Leaning Channel into Asia on the ABS1 satellite at 75 degrees East. United States, in review of future satellite needs, examines opportunities to increase international collaboration and orders from commercial providers, U.S. Air Force official says. SES-4 successfully performs post-launch maneuvers. Media Networks Latin American signs long-term capacity deal with SES fior multiple transponders on AMC-4 to launch new DTH wholesale pay TV service. LightSquared may be looking to Department of Defense to save its LTE network; FCC still believes satellite spectrum can be used for wireless buildout but will tread more carefully next time. Avanti partner STM buys Ka band capacity on HYLAS 1 to enable launch of Enterprise services in Spain. Comtech EF Data wins Industry Innovators Award from Society of Satellite Professionals International for MetaCarrier technology that adds carrier ID information to a reference carrier using spread spectrum technology. Officials eye changes to GPS receivers, but move comes too late for LightSquared. NSR reports that FCC statement all but negates years of work from both the FCC and the mobile satellite industry. Swiss to build clean-up satellites to attack the space junk issue. ORBIT Communication Systems and Milano Teleport receive orders for complete C-band VSAT solution for supertankers of one of worlds leading shipping companies based in Greece. Newly announced Intellian t80W maritime satellite TV antenna system uses WorldView LNB that automatically switches polarization and frequency according to satellite tracking onto, and satellite control system intelligence and dual antenna system that allows seamless reception of TV programs on a global basis. Harris CapRock Communications signs contract to provide telecommunications systems and infrastructure for Chevron’s Big Foot platform project in the Gulf of Mexico. IO Sat one of first customers providing services on Spacecom’s AMOS-5 satellite. NASA budget request includes funding for again launching astronauts, further exploration into space, and continuing research, providing jobs and technology that will boost the economy. Google applies for FCC licenses for “antenna farm” in Kansas that hint at possible super head-end for capturing satellite television signals for over-fiber distribution. FCC bars use of satellite spectrum terrestrially for broadband networks, sending LightSquared back to Square One. Gilat develops customized solution for O3b Networks’ satellite network. Xplornet Communications’ 4G broadband satellite service on ViaSat-1 goes live over Canada. Global Telesat Corp. launches E-Commerce mobile satellite solutions portal on worldwide web. ORBIT awarded services contract from U.S. Air Force to install service communication management systems on KC-135 Stratotankers. UtiliSat to offer end-to-end managed network services to U.S. government agencies under new GSA custom SATCOM solutions small business contract. FAB Express Trucking selects VeriWise(TM) satellite tracking systems to manage dry van fleet. YAHSAT begins transmission of High TV 3D. ViaSat phases out WildBlue brand for new Exede service on ViaSat 1. Spectacular view from International Space Station includes lights of hundreds of cities plus massive Aurora Borealis on the horizon. In February, 1990, Voyager-1 turned around and took its last photo of Earth — from 4 billion miles away. That photo opens this video. The late astronomer Carl Sagan wrote the accompanying narrative, putting everything in perspective. Thanks to PixelPusher for sending this over a couple of weeks ago. 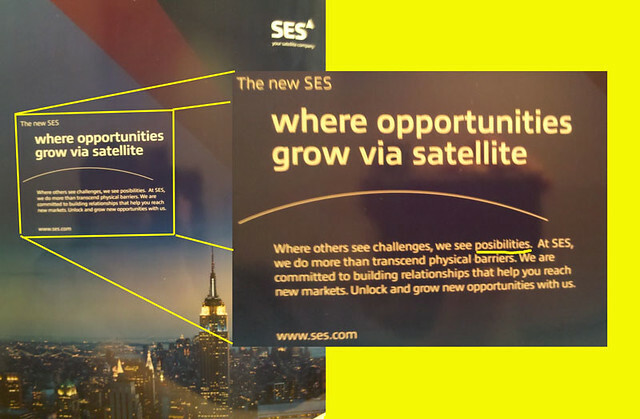 We used to joke “people need to know how to spell satellite” before they can do marketing or p.r. work for us. Maybe the satellite folks should learn how to spell “possibility” — or at the very least learn how to proofread their ads before they’re submitted for publishing. The above ad, which really doesn’t say much, ran on the cover wrap of the 16 January 2012 issue of Multichannel News, opposite a lead story on DISH Network (a big wholesale customer for SES in North America). In their “boilerplate,” they write “SES stands for long-lasting business relationships, high-quality service and excellence in the broadcasting industry.” Us rocket scientist know SES actually stands for “Société Européenne des Satellites” and that they’re based in the Groussherzogtum Lëtzebuerg (Grand Duchy of Luxembourg), not Holland. 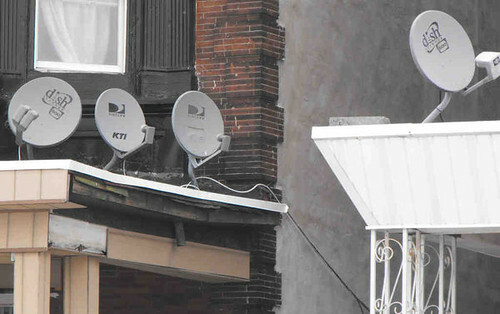 Section 207 of the Telecommunications Act of 1996 has been around for a while, obviously, but that hasn’t prevented the City of Philadelphia from passing a bill last fall to limit installation of satellite dishes. As Philly is Comcast’s corporate home, I’m not surprised. Enforcement of a bill passed by City Council last fall to regulate placement of TV satellite dishes has been stalled due to a petition filed with the Federal Communications Commission by the satellite-dish industry. The Satellite Broadcasting and Communications Association is fighting the bill, approved in October and sponsored by current Council President Darrell Clarke, prohibiting satellite-dish companies and installers from placing dishes at the front of homes unless putting them elsewhere would cause signal reduction or significant extra cost. A petition filed in November by the association, and pending before the FCC, alleges that the bill violates a 1996 over-the-air reception-device rule that blocks restrictions of satellite-dish installations without a public-safety concern or historic-preservation justification. “There’s no consideration,” said William Carter, Clarke’s director of legislative affairs. “We simply ask that they don’t do in our community what they wouldn’t do in theirs. “We were noticing a disparity in areas of the city inundated with satellite dishes. You don’t see this in Chestnut Hill, Society Hill,” Carter said, adding that more dishes are seen in areas with more renters. Philly has more than 100,000 dish users and was the first city to pass such a measure. Under the bill, dishes installed in the future must match the colors of homes, and hundreds of inactive dishes will be removed. I doubt Philly will get its way. People simply refuse to pay higher rates for TV entertainment, and urban neighborhoods with a high concentration of new immigrants will always opt for satellite TV service and their international programming options. I’ve seen more satellite antennas in cities than ever before. You can’t argue with popular preference. 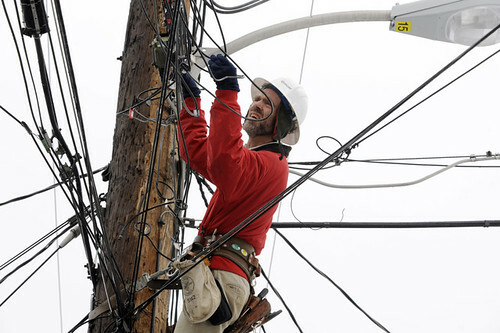 How about above-ground cables and wires strung from utility poles? Now that’s ugly! 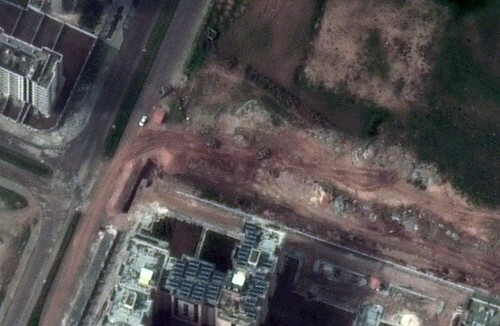 Stephen Wood, director of DigitalGlobe’s analysis center, said the photos show tanks, armored personnel carriers and other armored vehicles in the southern part of the city, some of them near apartment buildings. The satellite images show an increase in the level of army activity in and around Homs from the previous 24 hours, Wood said. Fighting in Homs has reportedly killed hundreds of people over the past week from bombardments followed by soldiers’ advances. The battle there is part of the Syrian government’s attempts to suppress an 11-month-old uprising against the rule of President Bashar Assad. Wood said no battle damage was visible in the photos taken Friday, but previous images captured by the company’s satellites did show the effects of fighting. Good job getting the images out. It’s good for business, especially if you consider there’s growth in the earth observation sector, according to Euroconsult. Check out their Flickr photostream. Very cool.